We’d love your help. Let us know what’s wrong with this preview of Footsteps by Umm Zakiyyah. To ask other readers questions about Footsteps, please sign up. I had the pleasure of living in the same community as Umm Zakiyyah, though at the time of reading "IF I Should Speak?" I had no idea that she was the same sister. lol I enjoyed the book immensely, and this one as well. I know a lot of women may take a certain stance that is covered in this book, but I feel that the author did a wonderful job conveying all the characters and their mind set. Wonderful book. This is a great book with a strong plot that took me with her (to the story) where each one of the characters tries to understand this life in the best way.. and I was there -with them- thinking about all the conflict that they are facing and what will happen to me if I was one of them? Umm Zakiyyahs books takes me behind my sight to think more about many things that i will face in my life even if I am not with her in some small details. Oh and for the people who have issues about reading books by Muslim authors: the English and grammar are absolutely perfect, so don't worry about that. It's a fiction book. You will enjoy it. Read it. This book gave me a completely new perspective about (1) polygamy and (2) racial struggles/issues. The best thing about this entire thing was that it was completely untypical fiction. There were so many racially diverse characters, which I have never seen before in any sort of literature. And the fact that Umm Zakiyya chooses topics that are interesting to Muslims as well (not just a typical story about a Muslim in high school who has the same problems as everyone else but not really because Muslim). It's such a compelling story that I think handles controversial issues well. My favorite of the three. The main problem I had with the book was that everyone was more or less had perfect faith, no matter what they thought of themselves. Everyone seemed like an ideal Muslim, which tinged the story and made it a bit unrealistic. Anyway my imagination could handle that because if it wasn't so, the story would have been a hundred times more complex than it was. Okay and the whole issue of polygamy...wow... that was definitely a huge tug of war and I could understand Ismael's side and definitely sympathize with Sarah. I understand a little more why it shouldn't be as tabooed as it is, but I understand that our reactions are also understandable. Haha okay this is a hard opinion to write about. I would never want to be in a shared relationship of course, but this book makes the readers understand that it is possible and that it is allowed (and why it is) in Islam. I'm still iffy about the fact that men's nature is polygamous and woman's nature is jealous...I could see why people have issues about that. The book not only goes into the nature of polygamy but also explores the reactions and relationships of all the people involved. I enjoyed how Kate, an outsider and non Muslims was more open to it than any of the Muslims. Overall, I was satisfied with the conclusion of the story that while polygamy is allowed, a truly understanding person (people) is (are) needed to carry through and shouldn't be attempted with any doubt in the heart. Race is honestly something I knew was an issue but never imagined it to be explored in fiction and I am satisfied with the result. Honestly if there wasn't any Pakistani character, I might not have payed as much attention to it as I did when Zaid's cultural views came into place. I could see (inadvertent? ingrained?) racism in my culture and it really hit home. If you don't plan on reading this book anytime in the next few years (for example, because you are too young ;) please DO NOT continue to read this review. I know you are really curious now, so all I will say is that a lot of the book covers an adult topic. Just from reading the back of Footsteps, I knew the topic of polygyny was going to be part of the book. (I think anyone can figure that out.) While this might be an odd/ different subject to write about, I like how Umm Zakiyyah is open to writing about different topics related to Muslims/ Islam. 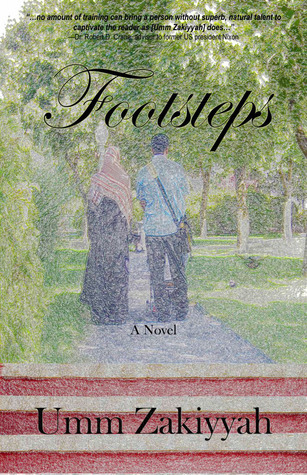 Footsteps focuses on Aminah and Sulayman's parents and while I don't like perfect characters, reading about Sarah and Ismael's thoughts and feelings about polygyny was frustrating at times. One minute I was sympathizing with Sarah and thinking Ismael was being silly/ naïve, while in other parts, I felt Sarah was overreacting and had some things she needed to work on understanding, if not accepting initially. My opinion of polygyny changed since high school when I first learned about the subject and even before reading Footsteps, but I think this book is good for those (adults) who have feelings for or against it just because Footsteps provides different perspectives on the subject. I also think married and soon to be married people should read Footsteps for the same reason. Besides polygyny, marriage is also brought up in Footsteps a lot (a subject that is becoming more and more relevant in my life...) I liked how the Nation of Islam was also brought up because it was explained and the difference it has to Islam (which many people don't know). The characters of Nusaybah and Alika were interesting to read about and good choices for Umm Zakiyyah to include. I really wish that I had someone like Nusaybah in my life (because of the way she explains things) and Alika, although not so "innocent" was a wise character for the most part. A continuation of the stories of the characters from the first two books - and this one deals with polygamy. It was a compelling read, although at times I felt like I was being hit over the head with a 'women are jealous by nature, men are polygamous by nature' stick. Considering the stance at the end of the book (that seems to be the author's) I'm wondering if that was supposed to be Ismael's thought process? I felt uncomfortable at times, since it felt like the author was advocating polygamy f A continuation of the stories of the characters from the first two books - and this one deals with polygamy. It was a compelling read, although at times I felt like I was being hit over the head with a 'women are jealous by nature, men are polygamous by nature' stick. Considering the stance at the end of the book (that seems to be the author's) I'm wondering if that was supposed to be Ismael's thought process? I felt uncomfortable at times, since it felt like the author was advocating polygamy for everyone, but by the end it's clear that her stance is the same as mine: polygamy is allowed, but it takes a sensitive and capable husband to do it right. When I reviewed 'A Voice' I said I thought it felt like the author's writing style had matured, and that's definitely evident in this book. This time I was able to be totally absorbed in the story without being distracted by anything clunky. this covers an uneasy topic and an Islamic opinion,I don't necassarily agree with some of the plot and actions in book Islamically,but from and eductaional view i learned some things i hadn't seen.also heart breaking issues. great insight to a world many will not know. Nusaybah's comment about not minding the "other" couple's business reminds me of a friend's similar sentiments....hard to swallow...but..if your soul depends on it, will you, too, submit? Daughter of American converts to Islam, Umm Zakiyyah writes about the interfaith struggles of Muslims and Christians, and the intercultural, spiritual, and moral struggles of Muslims in America. Umm Zakiyyah’s work has earned praise from writers, professors, and filmmakers and has been translated into multiple languages. In 2008, Umm Zakiyyah was awarded the Muslim Girls Unity Conference Distinguis Daughter of American converts to Islam, Umm Zakiyyah writes about the interfaith struggles of Muslims and Christians, and the intercultural, spiritual, and moral struggles of Muslims in America. Umm Zakiyyah’s work has earned praise from writers, professors, and filmmakers and has been translated into multiple languages. In 2008, Umm Zakiyyah was awarded the Muslim Girls Unity Conference Distinguished Authors Award. Umm Zakiyyah also writes under her birth name Ruby Moore.